It’s official, I have turned into my Mother. Yep folks, it’s true. I have turned into my Mum. Probably around about next summer. But soooooooooooo cute! Nice toggle skills. And the hat is AWESOME. I think you should have a matching one. The moment I realised I was turning into my mother was when I first told Dill ‘I want doesn’t get’ it’s all downhill from here! I bought Dill a coat he’d grow into last winter, it’s still a bit too big now. I like to think of it as a money saving exercise and one less thing to worry about!! You’d be surprised!! Don’t worry I sound like my mother more and more since I have had kids! It is odd isn’t it? 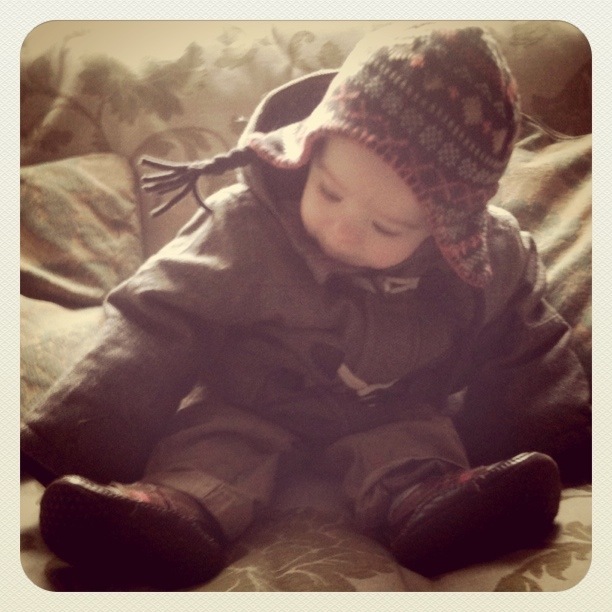 What a cute blog and an adorable baby. Yeah, I hate to say it, but as time passes things are going to fly out of your mouth uncontrollably and then you will realize, you sound like your Mother. I think it’s a curse or something…or revenge, one of the two. Oh thanks for popping over 🙂 Yep, it is happening more and more these days. and as the kids get older you hear yourself saying things to them your mother said to you….and you said to yourself pre-children I will never say this/that/next thing to my kids cos I hated it when my mum said it…..unfortunately children learn what they live…..just remember that when you say things to your kids…cos they pick your nursing home!! Brilliant! I might just steal that one! I’m always buying ‘grow into’ clothes in the sale. One year I piled everything out of the cupboard and searched through tor the (then) current size – only to discover I had purchased not one but THREE winter coats?!? So much for saving money! I know. I must have had a mad turn. I couldn’t quite believe it when I checked. We all do it. My hand-me-down skill is ….hand-me-downs!! My youngest is currently sporting a very nice selection of too-large jackets and trousers which his brother/neighbour’s son has grown out of. What he does not know can not hurt him!